Common Core State Standards for Language are divided into six anchor standards. There is no technical version for this section. 1. Demonstrate command of the conventions of standard English grammar and usage when writing or speaking. SEE EXAMPLE. 2. Demonstrate command of the conventions of standard English capitalization, punctuation, and spelling when writing. SEE EXAMPLE. 3. Apply knowledge of language to understand how language functions in different contexts, to make effective choices for meaning or style, and to comprehend more fully when reading or listening. SEE EXAMPLE. 4. Determine or clarify the meaning of unknown and multiple-meaning words and phrases by using context clues, analyzing meaningful word parts, and consulting general and specialized reference materials, as appropriate. SEE EXAMPLE. 5. Demonstrate understanding of figurative language, word relationships, and nuances in word meanings. SEE EXAMPLE. 6. Acquire and use accurately a range of general academic and domain-specific words and phrases sufficient for reading, writing, speaking, and listening at the college and career readiness level; demonstrate independence in gathering vocabulary knowledge when encountering an unknown term important to comprehension or expression. SEE EXAMPLE. Language Anchor Standard 1. Demonstrate command of the conventions of standard English grammar and usage when writing or speaking. This lesson focuses on how the "mechanics" of communication affect the effectiveness of our presentations. Exercise 1 directs students to view a PowerPoint with problems and then identify "bad" examples of verbal and written communication. Exercise 2 is a group exercise asking students to identify communication problems with online chats, instant messaging, email and texting. Exercise 3 asks students to identify and share one real-life communication problem they have experienced. Language Anchor Standard 2. Demonstrate command of the conventions of standard English capitalization, punctuation, and spelling when writing. This lesson discusses how to prepare a press release, including the importance of correctly using style, spelling, punctuation and grammar. The PowerPoint reviews main lesson ideas. Exercise 3 assigns the task of preparing a press release. Language Anchor Standard 3. Apply knowledge of language to understand how language functions in different contexts, to make effective choices for meaning or style, and to comprehend more fully when reading or listening. The topic of this lesson is how effective speaking and writing in a variety of contexts can help someone become a better leader. The PowerPoint reviews main lesson points. Students practice communicating by speaking and through writing in the exercises for this lesson. Language Anchor Standard 4. Determine or clarify the meaning of unknown and multiple-meaning words and phrases by using context clues, analyzing meaningful word parts, and consulting general and specialized reference materials, as appropriate. 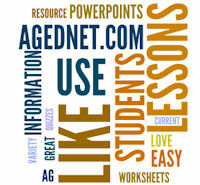 All AgEdNet.com libraries include a strong focus on using and explaining subject-related vocabulary. Technical words are defined the first time they are used in a lesson. The teacher's guide for each lesson contains a list of "Important Terms." Each lesson library comes with a glossary using terms from the lessons in that library. Over 800 interactive vocabulary crossword puzzles give students the chance to review vocabulary and practice correct spelling. Language Anchor Standard 5. Demonstrate understanding of figurative language, word relationships, and nuances in word meanings. Use one or more news articles from the AgEd Today daily news report. Explain to the students how the words used in the title or text of a news article can influence what someone thinks about the content of the story. How does the news article change if some words are replaced with others with similar meanings or when information is presented in a different order? First sentence: Conservation groups are petitioning the state Department of Fish and Wildlife to limit the killing of wolves in response to livestock deaths. Revised first sentence: Eight conservation groups are urgently requesting the state to quit killing wolves because of livestock mortalities. Language Anchor Standard 6. Acquire and use accurately a range of general academic and domain-specific words and phrases sufficient for reading, writing, speaking, and listening at the college and career readiness level; demonstrate independence in gathering vocabulary knowledge when encountering an unknown term important to comprehension or expression. A crop science lesson is used in this example, but this idea could be used with any lesson in any library. Each teacher's guide includes a list of important terms used in the lesson. They are listed right after the internet resources. Give students a list of the words at the beginning of class. Ask them to rate how well they think they understand each word. For example, 1) no idea what it means, 2) a vague idea about it or 3) could use it in a sentence. Have students find the words in the lesson or PowerPoint for this lesson and copy a sentence containing each word. Then have them write a definition for each word, using the glossary for the lesson library, a dictionary, or an online resource. Are there some words that could be used more than one way? For example, the word "terminal" is used in this lesson to describe buds appearing at the end of a stem. But it has other meanings, such as a terminal illness or a shipping terminal.